If you love to cook and cook often, you might be looking for ways to make your meals healthier. Using a great deal of fat and sodium in your cooking isn’t a healthy way to live, but luckily there are ways you can tweak your recipes into healthier versions of themselves. 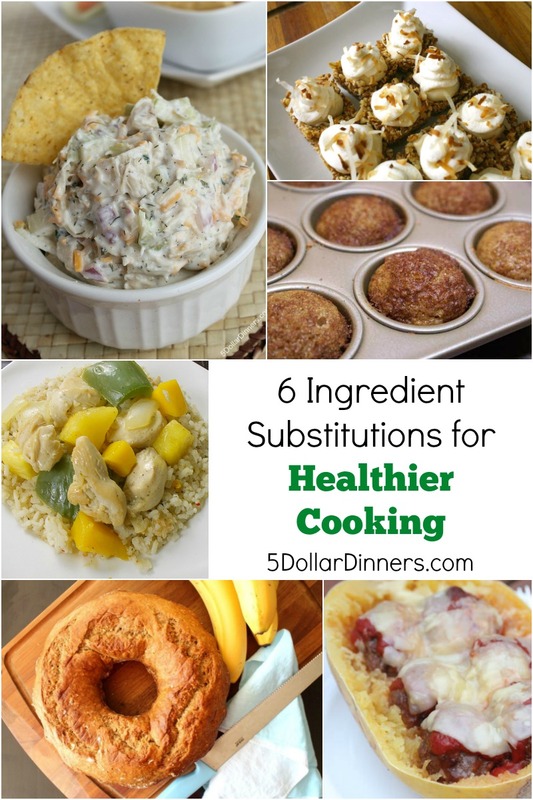 Take a look below at 6 ingredient substitutions for healthier cooking, so you can keep creating the recipes you love while still keeping your health in mind! You can substitute equal parts plain or Greek yogurt anytime a recipe calls for sour cream and in a lot of recipes needing mayonnaise. Whole milk yogurt is the preferred method as it contains more protein and calcium. Try this substitution when creating dips, in chicken salads, topping your favorite taco recipe, or even when adding flavor to your baked potato. You will still get the rich consistency without all of the fat. Olive oil and coconut oil are healthier alternatives to vegetable or canola oil. If you have a recipe such as grilling marinades that call for vegetable oil, consider olive oil instead. Olive oil is also fantastic for pan frying meat and fish. You can also use coconut oil in cooking, particularly in certain recipes like an easy Tom Kha Gai or my Pineapple Mango Chicken recipe! Coconut oil is also an amazing oil substitute in baking recipes like this Coconut Banana Bread and my No Bake Coconut Lemon Tarts. You will get great flavor from both oils without all the processed, unhealthy attributes of vegetable or canola oils. If you love pasta, try some of your favorite dishes using spaghetti squash like Spaghetti Squash & Meatballs or Pizza Stuffed Spaghetti Squash. Or grab a vegetable spiralizer and use it on zucchini for another pasta substitute. The consistency is much like pasta, and you can top it with all of your favorite tomato or meat sauces. Or use my Pesto Sauce recipe on top of spiralized zucchini for a delicious dinner idea! A side of spaghetti squash can also replace your baked potato if you are looking for a low carb option. There are so many rice dishes out there that can be made healthier with brown rice. You will find it is nutrient rich, full of fiber and antioxidants, and contains a variety of vitamins and minerals. White rice has been stripped of almost all nutrition, meaning it’s basically empty calories. Brown rice does take a little longer to cook because it’s the full grain with all the nutrients versus white rice that has been stripped of the bran and nutritious germ. So just plan on a little longer cooking time (and cook it in the oven with this easy tutorial) or invest in a rice cooker with a programmable timer! See all of our recipes featuring rice here. If you want to lower sugar from your diet, unsweetened applesauce can be used in place of sugar in many of your recipes for baked goods. Even reducing the sugar by half with a substitution of applesauce is much healthier for you! The applesauce offers sweet flavor (and moisture) without the need for cups of white sugar. Try this substitution in my Gingerbread Baked Oatmeal or some Cinnamon Butternut Squash Muffins. You can also make your own maple sweetened applesauce in the slow cooker here. If you enjoy cream in your tea or coffee, try coconut milk instead. It is not considered low fat or low calorie, but you are switching the empty calories and fat for a surplus of healthy fat that can also make you feel fuller. It’s rich and creamy, and can also help slow the rate at which sugar is released into your bloodstream (preventing sugar “highs”)! In addition, coconut milk is dairy free, so perfect for anyone with dairy allergies. So, kick your creamer to the curb and try coconut milk instead and see if you notice a difference. Coconut milk is also delicious in Raspberry Coconut Milk Ice Cream or in a savory dish of Coconut Rice & Beans! When it comes to eating a healthy diet, just swapping out a few common ingredients for healthier choices can make all the difference. Consider these 6 ingredient substitutions the next time you want to cook healthier and see what a difference they can make. You will still get tons of flavor without all of the unhealthy fat, calories, or sugar that some of the original ingredients contain.